Looking for a Nintendo Switch bundle for the cheapest price? 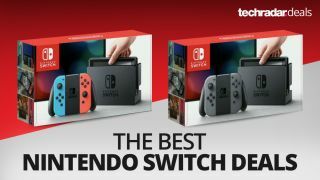 So you're into 2019 now and still haven't found any cheap Nintendo Switch bundles to suit you? Well, let's see what we can do about that as we scour the net for the hottest Nintendo Switch deal prices. We're listing all of the best Nintendo Switch sales right here and we're always on the the lookout for the best bundles with extra games, controllers and other accessories so we can share them with you while they're hot. Scroll past the bundles on this page and we'll show you prices on extra Joy-Con and Pro controllers and Nintendo Switch memory cards too. If you want to play online multiplayer and get other benefits like free games you'll want to pick up a Nintendo Switch Online subscription deal too. US Nintendo Switch bundles are small in number this week, but we've rounded up the best ones, including packs with extra games or accessories. In the UK you can find plenty with the best Nintendo Switch games like Super Smash Bros Ultimate, Pokemon: Let's Go Pikachu, Mario Kart 8: Deluxe and more all with a decent discount too. You'll find all the cheapest Nintendo Switch bundles from reliable retailers below. Want to know where to buy a Nintendo Switch? Check out our comparison charts and the latest bundle highlights with extra games and accessories below for the best deals. Don't forget, on its own, the MSRP/RRP Nintendo Switch price is $299/£279, so you don't want to pay more than that unless you're getting some extras. We've highlighted our picks of the best and cheapest Nintendo Switch bundles below. Just be aware that many game bundles at quieter times of the year don't really offer much of a discount over buying the items separately. We'll steer you clear of console bundles that actively charge you more than the regular combined MSRP (not cool, guys!). You can choose from a wide range of excellent first-party games in this Walmart Nintendo Switch bundle. Choose between Zelda: Breath of the Wild, Super Mario Odyssey, Splatoon 2 , Super Mario Party or Mario Kart 8 Deluxe. These games are all still quite pricey when sold on their own. You also get a USB-C adapter included as a bonus item, which is an odd bundle item choice, but the discounted game still makes this an excellent money-saving bundle. Starlink is the latest entry in the toys-to-life trend following the likes of Skylanders and Lego Dimensions before it. And Walmart's decided to bundle in the main game along with a ship and a pilot of your choice from a range of four options with this Nintendo Switch deal saving you over $20. The Switch's built-in 32GB capacity is a poor effort from Nintendo to be honest, so a memory card would be on your shopping list soon after picking up a Nintendo Switch deal. So why not solve that problem with this bundle? It's an officially branded card, which admittedly is just for show, but you save a couple of bucks here over buying later on. This limited edition Nintendo Switch bundle costs a fair bit more than the others thanks to the design, but you're also getting the new Let's Go, Pikachu! game, a Poké Ball Plus controller and themed Joy-Cons. This has sold out at most stores already so the price is only likely to go up from here! This is great Nintendo Switch bundle for multiplayer as it comes with the new Super Mario Tennis. And seeing as the Joy-Con controllers come as a pair, you're able to dive into the two-player action straight away. This Switch deal also comes with 1-2-Switch minigames collection to get used to your new console's unique controls. If you'd rather pick up games at your leisure this is the cheapest standalone price for the red/blue Nintendo Switch £20 compared to most other stores. Be sure to have a looksie at our selection of the best Nintendo Switch games if you want a little inspiration of what titles to shop for next. With so many of the best cheap Nintendo Switch bundles selling out so fast throughout the year, we're surprised to see this one going for such a low price. This deal comes with a copy of Mario Kart 8: Deluxe which is one of the finest multiplayer games on the Switch. Looking to start playing games online straight away? Then you'll need access to the new Nintendo Switch Online service and this bundle comes with a 3-month sub. Like the offer above, but this version comes with a longer 12-month subscription. So if you know that you're into your online gaming and don't need a shorter term to try things out, this is the Nintendo Switch bundle for you. It's about time we had some proper Pokémon games on the Nintendo Switch and this new special edition bundle comes with the new Let's Go, Pikachu! game, a Poké Ball Plus controller and themed Joy-Cons. This has sold out at most stores already! If you're not too bothered about the limited edition console cradle and Poké Ball controller, this Pokemon bundle is £50 cheaper than the one above. This works out cheaper than buying the console and game separately this week. The Eevee bundle is the same price too. As with any new console we imagine you're wanting to know a bit more about the console before you put any money down. So in addition to finding the best Nintendo Switch bundle deals, we're going to help bring in answers to the burning questions. What memory cards does the Nintendo Switch need? Those will be Micro SD cards also known as, depending on their size, as MicroSDHC (up to 32GB) or MicroSDXC (up to a huge 2TB soon). Nintendo also has their own branded cards, but you'll be paying more, just for a label. So for now, we'd take a look at this range of cheap MicroSDXC Nintendo Switch-friendly cards.